How much plastic do you think is in your life? Probably more than you realize. Werner Boote’s documentary film Plastic Planet explores the rapid expansion of plastics production and consumption since the 1950s, bringing both a global dimension and personal, intimate perspectives into the discussion. His main goal, and one that he is successful in achieving: to throw light on both the ubiquity of plastic and the illegibility of the plastics industry. Boote begins his story with his own family – his grandfather was an early plastics pioneer. As he stands on a polluted coastline full of plastics, Boote wonders: What would his grandfather think of the ways in which this lifesaving and revolutionary product that he was so excited about has developed? This is a reminder of both the complexity of the plastics issue (how can plastic blood transfusion bags be an ill?) and how unbelievably recent and FAST the development and dispersal of plastics (and plastics pollution) has been. As the film develops, viewers (and Boote) are led into the plastics development process – but only so far. Industrial secrets, patented technologies, and competitive industries mean that the means and materials of plastics production are withheld from us, are metaphorically as invisible as the chemical changes that happen within our bodies and ecosystems because of the global reach of plastics pollution. Boote provides a striking cradle to non-grave biography of plastic – from production (what he can show us) to recycling and disposal (including some disturbingly frank passages about the “plastic-pickers” in Calcutta who sift through trash to find recyclable plastics) to disintegration. I was struck by the way that the hope and promise of plastics are visible in the production plants and spokesman, and how hopeless the product becomes in its disposal, eventually leaching beyond our control as the chemicals dissipate into trash. Plastics pollute in obvious visual ways (plastic bags in the desert, truckloads of plastic bottles on a protected beach) and more insidiously at the chemical level, as Boote himself demonstrates by having his blood tested for plastics chemicals. This is sobering, yet in many ways the most powerful aspect of Boote’s film is the way that he successfully employs the medium of film to show us the visual realities of plastics. (The one exception to this is his use of animation, which will unfortunately date the film quite quickly). He uses old home movies, films of himself and others in a variety of locations where plastics are (grocery stores) and are not (empty stretches of desert) expected, and even a blow-up plastic globe that he transports around. He even visits the factory where the plastic globe is made, and is unable to learn what materials are in this allegoric plastic planet of his (and ours). Everywhere the camera shows more and more plastic than we imagine. The camera crews film traditional interviews, but also (by focusing on the material culture around both Boote and his subjects) the material ways that plastic has become mundane and overlooked. The part of this film that has stuck with me the most is the question that Boote asks of several families from many different income levels and nations around the world: “How much plastic is in your house?” Here is where the power of documentary is most clear. Through time-lapse photography and a very clever bit of staging, Boote shows the families and the audience just how much plastic is in their houses. He has all of the households (including a prosperous Japanese family, a working-class American family, and a poor family living in Calcutta) empty their houses of all plastics, and stack the items in front of the house. Almost all of the families are all surprised by how much plastic they had that they were not conscious of (the poorest household was very aware of what they had and did not have), and the audience is similarly surprised by the volume and variety of ways that plastic has seeped into our lives – not to mention our bloodstreams. Food containers, toys (even in the poorest household), tools, furniture, clothing, electronics, art, fabrics, jewelry, beach toys, medical supplies, decorations – plastic is everywhere. What would happen if you took everything that was plastic out of your house? For more about the film, please visit http://www.plastic-planet.de. 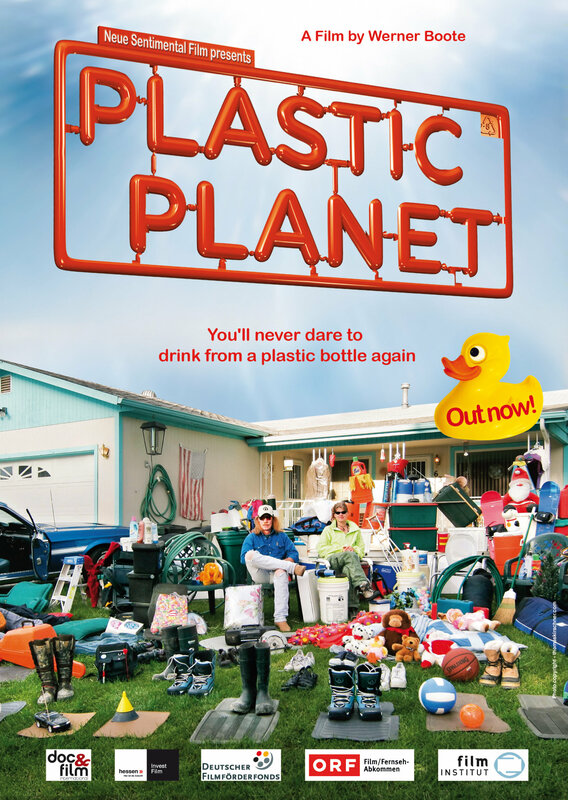 Hopefully, this film will become accessible to a broader audience, because it is a largely successful introduction to the ubiquity of the plastics problem and the plastics challenge we face.